This means you can enjoy two heat settings that can both be thermostatically controlled; three flame intensity levels, plus the additional option for a blue flame effect on the high setting to create a remarkably authentic log-effect fire - a superb focal point for any room. 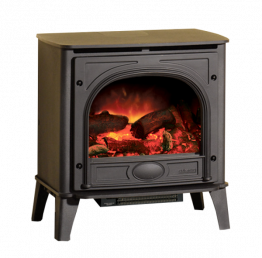 The fan heater is discreetly hidden beneath the stove with full control of both output and flame effect by remote control. The Stockton Small Electric stove plugs into a 13amp socket, so is particularly suited for conservatories or rooms without a chimney.